1. As a leader, and during the planning of the unit's mountaineering mission you are required to select the appropriate personnel. You should a. select two teams that consist of three expert rock climbers or assault climbers for each platoon and the remaining personnel should also be skilled in basic military mountaineering. b. select only personnel skilled in basic military mountaineering and after arriving at the area of operations select one assault team. c. select only volunteers that are skilled in basic military mountaineering and after checking their qualifications select the rock climber team. d. select only personnel experienced in mountainous regions, divide your teams and proceed selection of the best men available. 2. The art of mountain walking may mean relearning how to walk. 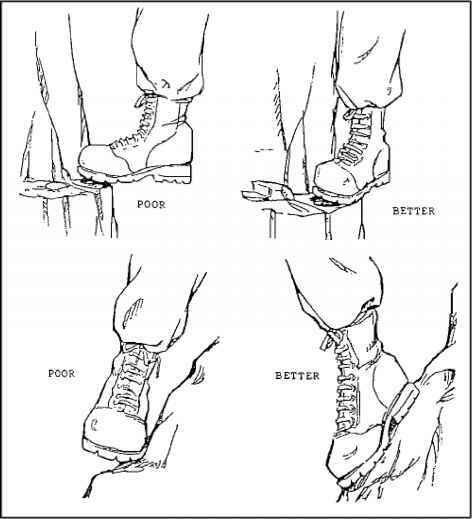 A proper technique you must consider, is to a. place your foot at an angle to prevent from falling. b. set a tempo or number of steps per minute. c. rest between steps by bending the legs slightly. d. avoid indentation that was made by someone else. 3. As a military mountaineer and while climbing you must set a cadence per minute based on the pace the unit is moving. You should a. keep an interval of one to three paces to enhance the rhythm and tempo. b. keep an interval of two to four paces to enhance the rhythm and pace. c. keep an interval of three to five paces between individuals to enhance the tempo, pace, and rhythm. d. keep an interval of two to four paces between individuals to enhance the tempo, pace, and rhythm. 4. When ascending on hard ground, you must a. choose each step carefully and make sure your back is straight. b. use the herringbone step with your toes pointed in. c. use the lower legs to sustain your weight and the upper legs to keep you in balance. d. have your knees locked on every step to rest the muscles of your legs. 5. While climbing, you are required to do a hop-step. You should a. use this step when you want to switch feet on the same foothold without an intermediate hold so that you may move sideways. b. use this step to insert your whole body into a crack in the rock. c. use this step when you want to raise your body. d. use this step to lean to one side of the rock face without falling. 6. A belay test must be conducted in order to ensure the belay position is stable. A position procedure for establishing a main-belay, is to a. ensure that the rope runs from the belayer through the climber's guide hand. b. use a pad when rope is running over sharp rocks and ledges. c. ensure that the rope running from the belayer anchor to the belayer is short and tight. d. release the middle portion of the rope, when the climber gives "Off Repell".